A Merry Heart – And A Group Look Link Up! 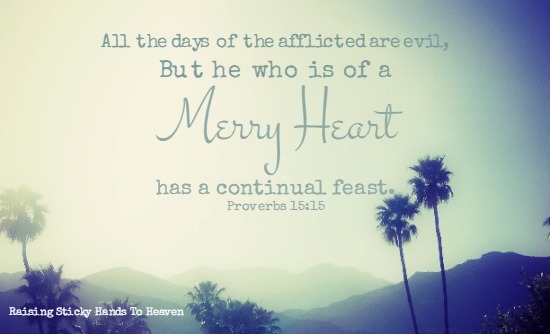 But he who is of a merry heart has a continual feast. When I was a teenager, I was already in a nasty battle with depression and anxiety that began in my childhood: The outcome of adolescent hormones and grief along with some unfortunate circumstances. I would become overwhelmed with everything wrong and I just couldn’t seem to get a grip. My Grandma would ask me what was wrong, and as I began to list everything off she would quip back with scriptures like Proverbs 15:15, Proverbs 17:22, and many others. She would give examples that usually involved Polly Anna or Corrie Ten Boom. But most of all she reminded me of the promise that not only did she love me but so does a sovereign God that is on the throne. I’ll be honest, sometimes I hated her encouragement. I wanted to sulk, cry, and vent. I always knew she was right, though. So I dried my tears and reminded myself of all the things she told me and go on with a smile on my face until the next “end of the world teenage crisis” would happen. Just like every other truth that is written in the Bible, the many scriptures about having a merry heart hold a lot of weight. If we don’t choose to be happy, even in the hard times, the negativity and darkness will overwhelm us and eventually lead to bitterness and extreme unhappiness. Without a merry heart, we see only the bad. But when we make that choice to be happy, no matter what, we are able to see the “sunny side” that the character Polly Anna talked so much about. With a merry heart, Corrie Ten Boom’s sister, Betsie, was able to thank God for the fleas that kept the Nazi guards from coming into their sleeping barracks instead of crying about one more problem during a time of extreme torment where evil truly afflicted every part of their days. Now that I am an adult and have continued this battle with depression and anxiety, I understand more of what my Grandma was saying. I have seen God’s power in my life to know for certain that He is still on the throne. No matter how dark things may get, or how many nights are spent in tears, God is always in control. Even when it seems that there is no hope, I know that there is. Does this mean that Christians should not seek medical help when things become unbearable? Not at all. By all means, if you need help, please get it. But it does mean that we should not focus on the evil around us. We should focus on the love of God, and rest in knowing that He will bring us through. With a merry heart, we will strengthen and grow. The scripture is saying that with happiness we thrive. I am living proof. In fact, if I hadn’t chosen joy quite a bit these last few weeks, I would certainly not be smiling today. Choosing to have a merry heart is not always easy, but it is always worth it. Now, time for the link up!